Albi, in which live more than 68 000 people, is a city located in southern France. 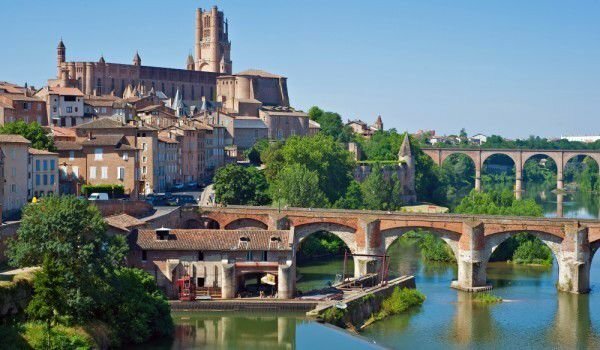 Six thousand years ago the territory where the municipality now Albi is, people had settled. The strategic location of the area led to its conquest by the Romans. Then they founded a city which became known as Civitas Albigensium. In the early eleventh century Albi began to expand. At that time, trade increased to facilitate the path of merchants, the bridge Pont Vieux was built. For crossing the bridge a special tax was imposed, which was not so small. This stimulated the economic development of the city. The bridge is still used. It is an impressive sight - first it was built of stone, and then for greater strength it was strengthened with bricks. The Bridge is 151 meters long. In the early thirteenth century, the Pope and French King join forces in their fight against the Cathars. At that time, hundreds of Cathars were burned at the stake throughout the region. Today the city is known as an attractive tourist center. The sumptuous Palais de la Berbie - a type of palace fortress was erected by Bishop Bernard de Castanet. Today the building of the palace is the museum of the famous French painter Toulouse-Lautrec. The post- impressionist Museum of Toulouse-Lautrec, who was born in Albi, was opened in 1922 after the Palais de la Berbie was no longer the bishop's residence and came inder the ownership of the city. The parents of Toulouse-Lautrec donated to the museum more than a thousand pictures and sketches of their son. This is the largest collection of works by the artist in the world. Bishop Bernard de Castanet is the main culprit for the construction of the Cathedral of Sainte-Cécile, whose construction began in 1282. The cathedral was completed only in 1480. The church-like fortress was built in Gothic style and is one of the most remarkable architectural achievements of Albi. The strict appearance of the cathedral is in stark contrast with its lavish interior that bears the stamp of the Italian Renaissance. The walls, arches and vaults are decorated with magnificent frescoes. The interior of the cathedral is decorated with many details. Unfortunately most of the statues of the interior of the church have disappeared. The church choir is decorated with numerous sculptures depicting angels and figures from the Old and New Testaments. The interior of the west facade is decorated with scenes from Doomsday. The area of the mural is divided into three parts, representing heaven, earth and hell. The mural was made in the fifteenth century and in the seventeenth century its central part was destroyed because the wall was made into a passage for the chapel, located beneath the tower. In the early sixteenth century were decorate the arches of the cathedral, which are beautifully preserved and cover an area of ninety-seven meters. The sanctuary wall is decorated with floral frescoes on which there are nearly three hundred images of the apostles and prophets. In France there are only a dozen historic monuments with such value. In the belfry of the cathedral for many years have nested hawks. The festival of music in Albi is an event that is visited by many tourists. This is a three-week festival, which starts in mid-July and continues until early August. It features acclaimed symphony orchestras, choral groups, chamber orchestras and renowned pianists. The event usually includes more than 10 separate events taking place in places like the Palais de la Berbie, the cathedral church of Sainte-Cécile and Madeleine.